She spent her first two years of life in a house on the campus of Elizabethtown College, where her father worked. Her mom lived in the Myer Hall dormitory as a student 60 years ago. Her husband’s an alum. Nostalgic as Lisa Clemens is for Elizabethtown College, she knew it needed to make its housing more attractive for students in this century. When the college called on Murphy & Dittenhafer Architects for help, Clemens, the Senior Interior Designer of the firm’s interiors division, Murphy & Dittenhafer Interiors, was up to the task. College admissions is a competitive business. Students must find the academics they seek and be attracted to live on campus. “I had to rethink the spaces you see when you walk into Myer Hall and make them more contemporary,” says Clemens, who also had to respect the tradition her mom felt six decades ago. A tall order within an existing 70-year-old building, but Clemens started only this spring, and the school needed the job done when students enrolled this fall. Her connection to Elizabethtown helped, says Frank Dittenhafer, II, FAIA, LEED AP, president of the firm. 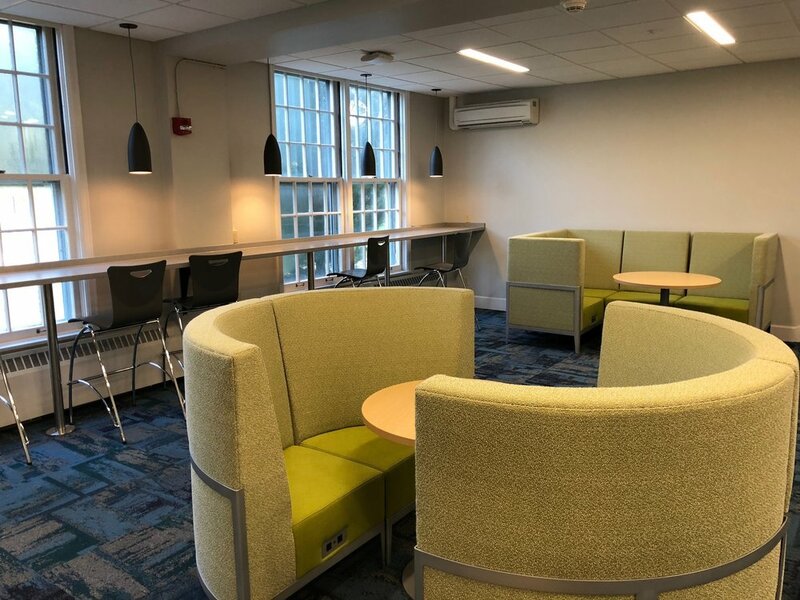 Students entering Myer Hall were greeted by a wide-open space with typical lounge furniture and not much happening, walled off from exterior rooms for studying, playing pool, or meeting with an RA. Clemens re-did the lounge, putting a bar-height surface with stools along one 30-foot long window, taking advantage of natural light, with plenty of plugs for electronics. Some of the furniture, sofas and chairs, have partial sidewalls attached to them, creating what are called freestanding privacy lounges. Students still need quiet, private spaces. A study room was kept along the exterior, with natural light from windows looking onto a redesigned courtyard, a table for up to six students, and a white board, one of which is also in the main lounge. Rooms facing the courtyard range from the quiet study room to the gaming room — including a pool table — as well as a communal printing room and a kitchen/vending area for getting drinks and snacks. M&D re-did lighting, replacing solely ceiling fluorescents with up-lighting, pendants and sconces, while keeping some ceiling lights. “This gives you needed task lighting, but is more hospitable and less institutional,” Clemens says. Having spent her first two years of life running around this campus, connecting to the outside made sense to Clemens. The exterior rooms look onto the redesigned courtyard, which M&D stretched string or ball lights across. There are trees and a re-pointed brick planting area. On campus earlier this year, Clemens showed her drawings for the design to some students. “It was invaluable to connect with students because this project is directly about student life,” Dittenhafer says. Her deep, personal connection to Elizabethtown makes this work fun and interesting, but Clemens stresses she feels privileged to work with every client.